According to the world wide web and the masters of the fashion universe that set the seasonal trends we all seem to drool over, this year’s official fall color is Oxblood. A gorgeous hue that can range from rusty red to a deep dark burgundy, Oxblood looks great on most complexions and can be coordinated with a wide variety of colors and is easily worked into an autumn wardrobe as a fantastic accent color (think scarves, nail polish, shoes, jewelry…). But how does that affect the equestrian world (aside from bringing back nostalgic memories of my beloved rust breeches, of course)? Well, this season we’ve gotten in racks full of fantastic fall finds that will go great with this season’s “it” color. This awesome jacket is loaded with features that will make you hope for inclement weather just so you can show it off at the barn. Whether your winters are bitter cold, fairly mild, or filled with the sort of days that change from one moment to the next, this jacket handles anything Mother Nature throws its way and keeps you looking good all the while! Made from Hydrotek™, a waterproof breathable fabric, this jacket is lightweight enough to be worn on its own on milder days and can easily accommodate thick layers to bundle up for the cold. Big cargo pockets offer storage and, best of all, the gorgeous plaid works so well with the warm fall tones. Try pairing this coat up with the Kerrit’s Heathered Half Zip Fleece in Ember or add a warmer mid layer with the Oh So Luxe (I call it the Oh Em Gee It’s So Soft Jacket! ), also from Kerrits. versatile these garments are with a huge range of colors! The plaid is just bold enough to make the sort of statement I want in an outerwear piece and can easily be brought back to earth with deeper, darker colors for those who want a more conservative look. Plus, with a removable faux fur trimmed hood and lovely toggle closures, this vest has become an instant staff favorite. Looking for something comfy and sporty? 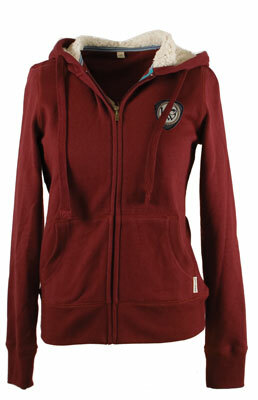 Try the versatile Sherpa Fleece Hoodie by Horseware Ireland. This easy, mid-weight sweatshirt is soft and comfortable. In 100% cotton with a Sherpa fleece lining inside the hood, it’s a great “go to” piece for those casual days. Pop on a puffy vest – like this chocolate brown one with leopard collar – and you’re ready to step outside in a cozy, comfy outfit. So while Oxblood floods mainstream retail, know that Mary’s Tack and Feed has got you covered with plenty of awesome choices that will work beautifully with whatever fashion (and of course weather) the season has in store. What’s your must-have color for fall? Do you have a favorite piece that has you chomping at the bit for colder weather this year? Questions or comments? Need some fit tips? No matter what it is, Mary’s is ready to help you out. Our savvy buyers love doling out advice on their very favorite topics, so leave us a note in the comments or give us a call at 1.800.551.6279. We can’t wait to hear from you!